William Shirer's The Rise and Fall of the Third Reich is an epic text, a full 1400-pages (my paperback, at least) of facts, figures, historical minutia, and judgment. First, let's handle the facts, figures, and historical minutia part. There is no question that Shirer knows his subject. As a reporter in Berlin in the 1930s, he literally watched Hilter's rise to power and his steady undermining of a democratic government until it was no more. In fact, he witnessed many of Hitler's speeches (and those of his party cronies) at various times before leaving Germany when he began to fear for his life in 1940. The strength of this book is Shirer's unrelenting pursuit of getting the facts down, right down to the personalities involved in events large and small. One of his favorite phrases is "and so X passed into history," as a way of saying this minor player did his bit and that was that. His focus is wide and specific, from Hitler, to his generals, and just about everyone else of military and political note in Germany during the period. Special emphasis is also given to Hitler's association with Mussolini, and also to the state relationship (and treaty) with Russia prior to Operation Barbarossa in 1941. Of course, there is general information here about the many battles of the period, but also of the politics and propaganda that preceded these actions in given countries. And the detail! Shirer documents as much as possible, including the inevitable march back to Germany and Berlin. Much of this is shown with evidence gleaned from the Nuremberg War Trials (both administrative and militarily), with documents that are at the heart of this book. A familiar refrain is "from documents presented at Nuremberg...". Within 1400 pages, readers will see this a good deal. Now to the judgment part. At times, Shirer comes across as somewhat "old school" in his descriptions of Nazi leaders, who happened to be homosexuals, as "perverts" and "deviants" as if these terms were naturally connected to other acts (like murder) associated with a brutal regime. Granted, the paperback I read was a few years after the original date of publication (1960), so perhaps these tenuous connections regarding sexuality were addressed in later editions. Still, there is no denying this is a book of considerable importance. It's by no means an easy read, but wading through these pages that document some of the most extraordinary events in recent history should leave the reader with the sense of satisfaction in climbing a vast and considerable non-fiction mountain. 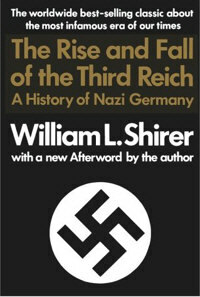 Please also check out WW2DB managing editor C. Peter Chen's review of The Rise and Fall of the Third Reich. The first mention of 'Hitler' in the review has been typed "HILTER'S"
as rightly it should have been as the subject was not of the man himself, but of his rise to power. As far as the language being "politically incorrect." The usage of the now unpopular language was handled as it was common in the era. You raise an interesting question about the homosexuality of Nazi leaders. Is homosexuality a deviant or perverse behavior in all cases, or is homosexuality as natural as heterosexuality, with perversion and deviance common to both along the line that joins these extremes of sexuality? But, isn't it true that many Nazi leaders engaged in homosexual acts with multiple partners and with children? If so, then you seem to be suggesting that we be tolerant not only of homosexuality, but of all forms of sexual relations, and that there is no underlying ethic or morality that governs those relations. In a sense, if that is indeed the case, you are also condoning all other acts that were committed by the Nazis, as a mere expression of their morality, which is no better or worse than any other. This is the logical conclusion we must make when advancing the thesis of tolerance or moral relativism. There is a very obvious ethic and morality governing these relations - it can be summed up as 'consenting adults'. It's not about moral relativism, it's about not harming others. I'm reading this now. I figured it would be dull history, but I am loving it!